Jared Unzipped: 'The Force Awakens' Made Me Realize I'm Not A Star Wars Fan. 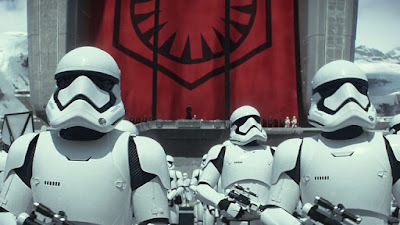 'The Force Awakens' Made Me Realize I'm Not A Star Wars Fan. The morning of Sunday, December 20, I settled into a theater seat and watched Star Wars: The Force Awakens. As it was a matinee showing, I was surrounded mostly by young children and grandparents. There were the occasional millennials and thirty-somethings present, but we were definitely in the minority. As the theater fell dark and the film began, we all sunk into our seats and prepared for the most anticipated film of recent history. Needless to say, I walked away afterwards feeling indifferent and altogether unimpressed. From here on, this article will have pertinent spoilers about Star Wars: The Force Awakens. If you're adverse to spoilers, please stop reading now. Just like the stormtroopers, The Force Awakens is a whole lot of the same thing repeated over and over. My biggest gripe with SW:TFA is that it's unoriginal. If you've seen A New Hope, then you've essentially seen The Force Awakens. The writers of the latest film basically played 52-Card Pickup with the plot from A New Hope. They threw all of the old plot and character elements into a heaping pile, reshuffled the pieces and then put the story back together. Obi-Wan became both a geriatric Han Solo and a grizzly Luke. Luke became Rey. Young Han Solo became Finn. There's a lost droid with an integral bit of information for the Rebel Alliance... er, I mean "Resistance". Lots of action takes place on a desert planet. A masked overlord shroud in black slaughters people recklessly. And most annoying of all... there's yet another giant spherical weapon of death that has a killer laser beam. If you didn't know I was talking about TFA, you'd believe I was describing ANH. In terms of the plot, much of what happens in TFA is highly coincidental. X-Wing pilot Poe Dameron just happens to be on Planet Jakku to retrieve a map leading to the mysterious Luke Skywalker. Rey also just happens to be on the same planet, living in exile after being abandoned by her unknown family. Poe's droid BB-8 just happens to wind up with Rey. Finn just happens to be a Stormtrooper with an inexplicable change of heart in a battle on Jakku. Rey and Finn just happen to steal the Millennium Falcon, which just happens to have been previously stolen and left on Jakku. Han Solo and Chewbacca just happen to find the Millennium Falcon the moment it leaves Jakku. That's a lot of just happens; too many for my personal taste. Mind you... that's not even half way through the movie. The coincidental events continue on like a massive thread of serendipitously placed dominoes. It's all just a little too perfect. Oh look, ANOTHER giant round ball of death! In the end, the "Resistance" fighters do a trench run on the Death St... er... I mean Starkiller Base, fire into an exposed thermal oscillator conduit (aka thermal exhaust port) and blow it up. I might as well have been watching A New Hope drunk. This brings me to Kylo Ren, perhaps the least imposing Star Wars villain of them all. Lacking the terrifying omnipresence of Darth Vader, the unbridled wrath of Darth Maul, or even the cocky self-assurance of Darth Sidious, Kylo is nothing more than a unruly teenager with a poor man's lightsaber. He spends the entire film moping in hopes of being like his grandfather. Yet, this raises a very large plot hole that goes completely unanswered. If Kylo wants to be so much like Darth Vader, wouldn't he understand that Anakin Skywalker eventually redeemed himself and saved Luke from the dark side of the force? It's like he has selective amnesia, remembering Anakin/Vader only as an operative of the dark side. Forget all that back story about Anakin being a jedi. Forget that he sacrificed his life to save his son and end the Empire. No no no... we're only going to remember that he wanted to rule the galaxy. Sheesh... give me a break. If Kylo wants to be so much like Darth Vader, he should do us all a favor and force lightning himself to death right now. Finally, the original whiny teenager himself, Luke Skywalker. We literally see him for the last moment of TFA, though he doesn't speak a single line of dialogue. For the brief scene that we do see him in, Luke stands there staring at Rey, whom is holding her arm extended with a lightsaber for an awkwardly long time. Who does that? It's all just very contrived. Much less, why did Luke purposefully leave a map to find him if he didn't want to be found? Supposedly, Luke left everyone behind when his apprentice Ben/Kylo went rogue, never to use the force again. But we're expected to believe he left a map to find him? Seems like that map was a cheap MacGuffin crafted by the writers to move the plot along, with no real explanation. Let me change course and highlight what I did like about the movie. I want to be very clear in my assessment of TFA. It's not a terrible movie by any measure. The acting is decent by most of the cast. I greatly admired the cinematography. Characterizations by the new cast members were likable, especially John Boyega's Finn. He stood out as the character I most connected with. Here's a guy who had been brainwashed since birth to be a Stormtrooper, only to realize that he's more than just a literal number in an enormous empire of death. There's a great story to be told from Finn's angle. 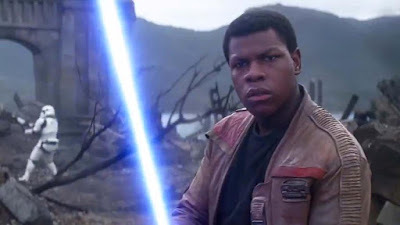 Given that Finn also found the courage to wield a lightsaber without having any apparent force ability, that tells me he's not afraid of a challenge. Had TFA just focused on Finn and his journey from insignificant cog to hero, I'd probably have liked the movie immensely more than I did. Finn, the best part of The Force Awakens. Ultimately, I left the movie theater that Sunday feeling incredibly detached from the Star Wars universe. The story didn't make any sort of impression on me. I liken it to watching an old episode of a soap opera. Sure, things happen and characters move from one place to another, but none of it really matters. Now... here's where the title of this article truly comes into play. As I thought more and more about how bored I was by TFA, I was reminded of how much I actually dislike A New Hope. Yes, that's right... I do not like the very first Star Wars movie. Even as a child, I always found it to be lackluster and a little too convenient. Clearly, this is a matter of personal preference. Millions of fans around the world enjoy the original Star Wars movie a great deal. For me, though, Star Wars: A New Hope is all too predictable. Boy meets mentor. Boy saves princess. Boy learns how special he is. Boy becomes hero. Boy defeats the evil empire. I'd read and watched various elements of ANH in countless other media. George Lucas himself has even admitted to culling plot elements from other sources (John Carter to a great degree), so I'm not in the wrong on this point. Boba Fett and the bounty hunters. Sure, the various bounty hunters occupied only a few minutes total of screen time in The Empire Strikes Back, but their visual presence alone was exceedingly powerful. I'm a huge fan of not just Boba Fett, but the other hunters like IG-88 and 4-LOM. The whole notion that the Empire is forced to turn to over-the-top bounty hunters with nothing to lose adds a real sense of danger to the story. The original trilogy closes out with Return of the Jedi, which I don't truly care for either. We get ANOTHER Death Star to contend with, which is strangely destroyed in almost the same manner as the first one. Did the Empire learn nothing of their mistake? There are chirping teddy bears (aka Ewoks) that somehow manage to defeat an army of trained, armed-to-the-teeth Stormtroopers. Darth Vader does a peculiar about-face and flip-flops, saving Luke and destroying the Emperor. George Lucas even drops Boba Fett, the best damn character in the whole universe, into a literal hole and kills him off. 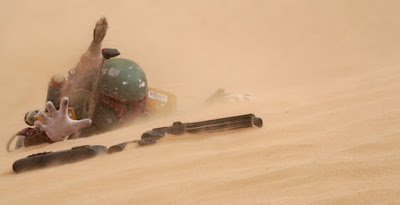 Mind you, Fett probably escaped the Sarlacc Pit, but that hasn't been confirmed yet in the new "Disney certified" continuity. Thanks a lot George Lucas. To save you the trouble, I won't even begin to describe the disgusting quagmire that is the Prequel Trilogy. You and I both know it's terrible, so let's just leave that alone. Out of seven Star Wars films, I have come to realize that I only actually like one of them -- The Empire Strikes Back. Sure, there are elements within the other six movies that I enjoy (the various droids, alien designs, vehicles and mecha), but overall the films are not to my liking. For so long, I had this silly notion in my head that I was a Star Wars fan. I simply must like Star Wars because I'm interested in geeky things, right? Yet, it never actually occurred to me that to be a Star Wars fan, I should probably enjoy the subject matter. Liking Star Wars was just something I accepted for many years, without any true consideration as to my own feelings. The Jedi? I really don't care. Yoda, Luke and the rest of the knights with glowing swords and magical telekinesis? Not interested. Darth Vader? One dimensional. Han Solo and his suave persona? Save it for someone else. Why have I wasted my time on a story that I don't even enjoy, except a few key elements and one of seven total movies? The Force Awakens helped me to see where I was wrong. I don't have to like Star Wars at all. For that, I am grateful. I am definitely a fan of The Empire Strikes Back. Held in its own regard separate from the rest of the Star Wars series, The Empire Strikes Back is a powerful, awe-inspiring spectacle that's completely watchable as a stand-alone movie. More so, I'm certainly a massive fan of Boba Fett and the other bounty hunters. But am I a Star Wars fan? No, I can now safely say that I'm not. I owe that to The Force Awakens, though that's certainly not the outcome the producers of the film certainly would expect. Let me know when they make a stand-alone Boba Fett film. I'll be first in line. Until then, I think I'll pass. Star Wars -- I'm breaking up with you.